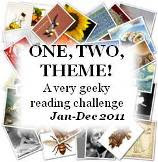 The TBR challenge is hosted by Adam, a.k.a. The Roofbeam Reader, and requires participants to read 12 books that have been on their shelves for over a year. A list is required and is considered final on January 1, 2011, when the challenge starts. It lasts all year. I just walked around the house and looked at my bookshelves and selected the books below. Maybe they'll be lucky and will finally get read! Let me know when you're starting The Vanishing Act because it's also on my TBR. Thanks for taking the challenge with me! The Death and Life of Charlie St. Cloud is one of my favorites - I hope you enjoy it! I don't know many of the books on your list, so I look forward to your reviews! Great choices! I'm doing the TBR Dare instead, since it only requires you to read from your TBR shelves for three months. I couldn't do a set list like the TBR Challenge requires! I can limit myself on types (or sources) of books, but it's really hard for me to limit myself to specific books. Good luck!! I need to take on a challenge, this year it was to read 100 random books and I just finished number 155, so I met that one. Now what to read next year? What authors, genres, etc. I only have 16 on my TBR list right now. Alex - OK, I will! Adam - I've heard lots of good things about that one, I suspect I'll really like it too! Erin - how funny, your dare seems lots more constricting and therefore scary to me than this challenge does. Good luck to you too - the point is the same and I hope we both manage to read from our own stacks a bit more! I should do this as I easily have a lot of shelf sitters that have been there for years! Have fun and hope you enjoy all of your books! Iliana - I always think this one is good to strive for, if I read even one book off this list it'll be good! Lots of challenges next year, I didn't join many this year and missed my lists!